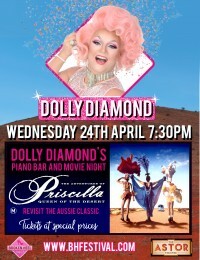 Dolly Diamond’s Piano Bar returns to the Astor for this very special Anniversary screening of PQOTD. Join Dolly Diamond & Cameron Thomas for an evening of song in the upstairs foyer at 7.30pm, before the screening of this Australian camp classic. A glass of Prosecco with each ticket purchase will have everyone singing along to I will survive on this Anzac Day Eve.